A dress by Karl Lagerfeld for Chanel now on view at The Museum at FIT, part of the exhibit Daphne Guinness. This post should be subtitled “I Need Some Chanel Right About Now.” Every October I feel this way, wanting to break out all the dark clothes in dramatic colors, the black, the purple, the midnight blue, the deep dark moody red. 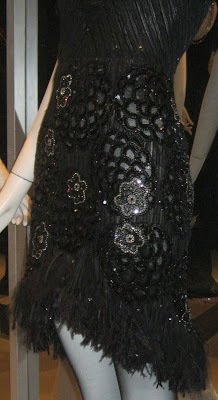 This Chanel dress from the couture collection of Daphne Guinness, now on view at The Museum at FIT, exactly fits my mood. It is elegant, it is black, it is Chanel. There are feathers, there are flowers, there is shimmer, there is shine. Do not even get me started on the diamanté necklace starting in the front and draping down the back. This beauty is from the “Evening Chic” section of Daphne Guinness and it is divine. Forget the Halloween costume, I want to wear this to greet trick-or-treaters on October 31. A closeup of the amazing bodice and flower sleeve, with feathers attached to the edge. Also note the stunning necklace and what appears to be an owl brooch attached to the back of the dress. I will look into this and get back to you as soon as the exhibit catalog is released later this month. 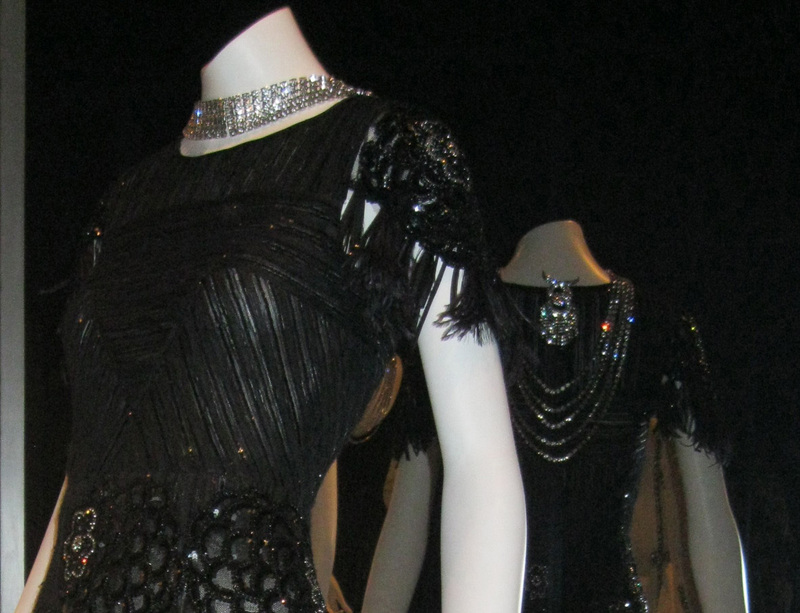 I never get tired of feathers and sequins. Is it from all the time I spent in Las Vegas as a child? I'm sure the feathers and sequins were a bit different in LV! What a gorgeous dress--thanks for sharing! First I wish I had the body for the dress...then I would want this dress...it is great! I just watched the Birkin episode of Fashion Hunters...now I think I have to read the book!! That piece . . . . What I love most about it is that it shows couture and artisanal perfection are so not over. If this exists in the world, then there's happiness! Sooooooooooo wonderful, my dear Jill. Great post! So glad you shared, as I won't have a chance to see it in person. Yes, I agree and love the subtitle, LOL. 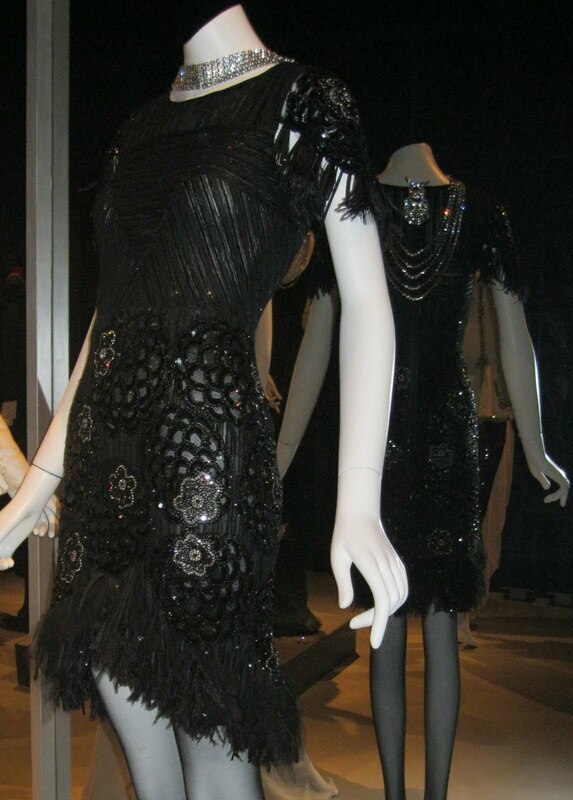 How fabulous sequins and feathers are, well it just never bores me... Beautiful dress! Hi Paula, yeah, feathers and sequins in Vegas. I'm thinking of those showgirl statues on pedestals (literally) at one of the casinos that we used to drive by on the way to Grandma & Grandpa's house! Hi Pam, if you read Michael's book, let me know what you think! I thought it was so entertaining and very telling about people who have no qualms about dropping thousands of dollars on a bag. Did Michael spot a fake Birkin? Hi Catherine, it's funny, you bring up something I've thought about before--if a dress that gorgeous can exist in this world I am happy, even if I don't own it, even if I never wear it. I don't know what that is, but just seeing it makes me happy. Sacramento, what's magic are those blue fringe earrings you are wearing in your latest post. I LOVE them. Your daughter is so talented! Hallie, you bad girl you! I ordered those Nine West snakeskin Mary Janes that are WAY too high-heeled for me. I wish Nine West would pay you a little commission. I thought you looked so cute in yours I had to go for it too! Hi Madison! I am so with you, I never get tired of feathers or sequins, and I gather that Daphne Guinness doesn't either, based on clothes that she owns that are currently on display! I wish she'd invite us over for a game of dress up. Right? Oh this dress is exquisite! 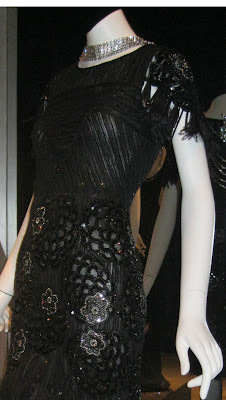 I never get tired of feathers and sequins either - I could look at them all day - maybe I lived in Vegas in a former life? this is gorgeous. feather it up!